Loosen thumbscrew and slowly insert cable into drain. Continue to slowly feed cable into the drain. Once you hit an obstruction, tighten the thumbscrew and turn knob clockwise using slight inward pressure until cable has made it through the obstruction. Repeat until blockage is cleared. To remove the snake, keep drum close to drain opening, loosen the thumbscrew and turn knob counter clockwise until cable head is back to its original location. Flush with water after clearing the obstruction. 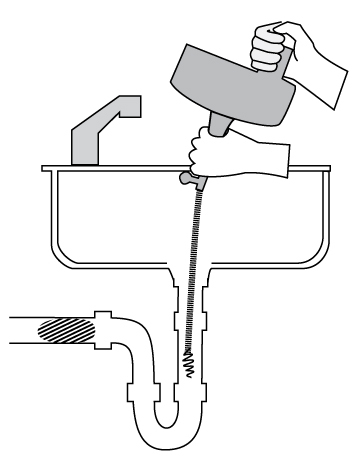 Feed the drain tape into any small pipe or trap until obstruction is met. Using the frame to gain leverage, begin a gentle push-pull action to clear the clog. Flush with water after clearing the obstruction. Insert the Zip-It tool into your sink, shower or tub drain. Once the bottom of the handle is touching the top of the drain, pull it out slowly to avoid any splashing. 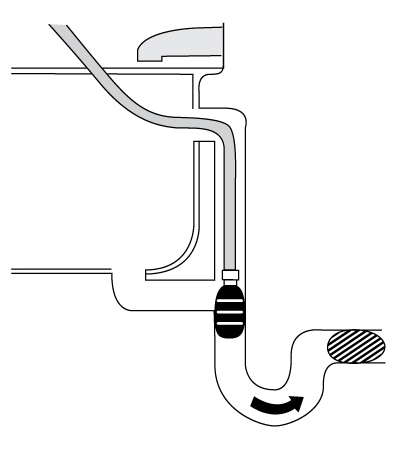 Attach the Drain Cleaning Bladder to a hose connected to a cold water faucet. Place into the clogged drain – a minimum of 6 inches. Turn on the cold water slowly to full pressure. As water fills the Drain Cleaning Bladder, the unit will expand to fit snugly against the walls of the pipe. 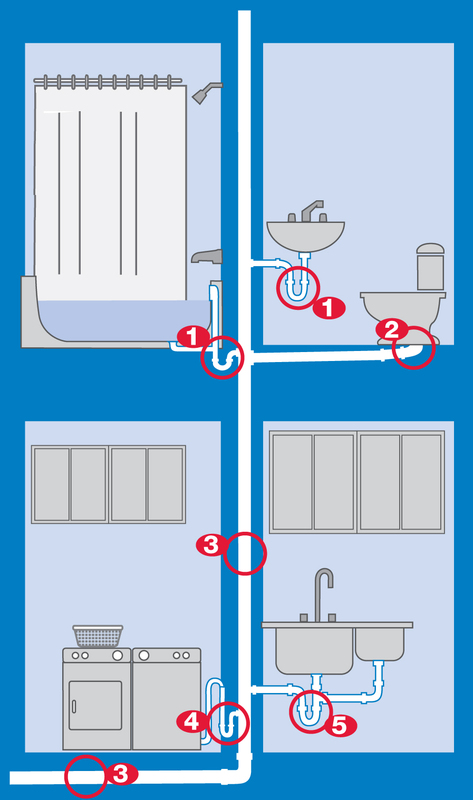 When the unit is fully inflated, water will be forced out the end of the Drain Cleaning Bladder to put pressure on the clog and push it through the drain pipe. 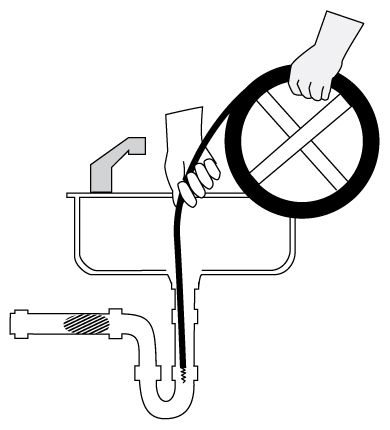 Turn the water off before removing the Drain Cleaning Bladder. Uncoil rod by lifting wire over frame one section at a time. Insert boring head into drain opening. Continue slowly feeding cable into drain until clog is reached. Squeeze handle to secure grip on wire. Use back and forth motion until boring head has loosened clog. Repeat until blockage is cleared. Flush with water after clearing the obstruction. Toilet augers work when plungers don’t. 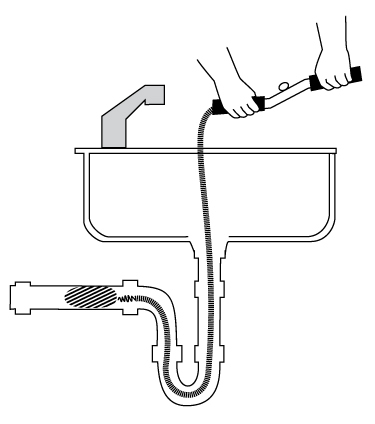 Holding toilet auger tube in one hand, pull the crank handle from the tube until spring cable is drawn into the tube. 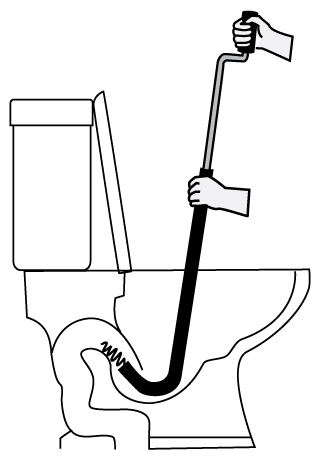 Place auger in toilet bowl with end of cable pointing towards the opening. With curved end directing cable, push down with moderate force while turning the crank handle. Continue until obstruction is cleared. 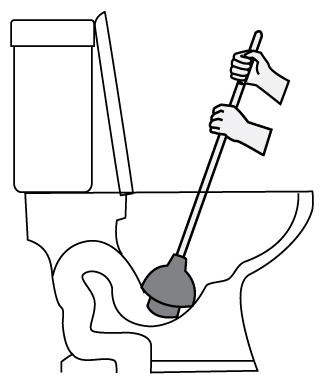 If toilet is full, bail out some of the water so that it does not overflow when placing plunger into bowl. After you place a towel around the bowl in precaution of any backsplash, place the plunger in the bowl and completely cover the drain opening. Push down on the plunger with quick and powerful thrusts, to create pressure down the drain towards the obstruction. Repeat this step until the obstruction is cleared. Securely cover and seal the overflow drain with a wet cloth. If the obstruction is in a sink place a towel around the sink in precaution of any backsplash. 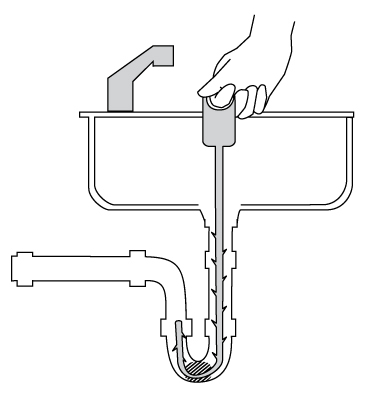 Place the plunger over the drain, making sure to completely cover the opening. Push down on the plunger with quick and powerful thrusts, to create pressure down the drain towards the obstruction. Repeat this step until the obstruction is cleared. Position machine within 2 feet of the drain. 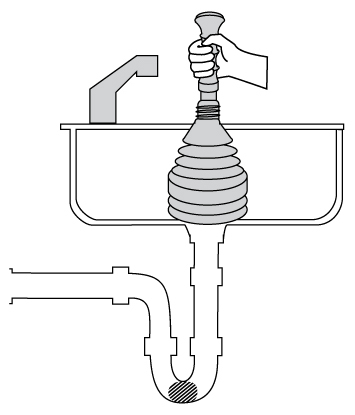 Loosen the chuck with the chuck key, and pull sufficient cable out of the drum and place the end of the cable as far into the drain as possible. Plug the power cable into the electrical socket and switch the power on. Switch the drill direction to forward (FOR) and fully depress the trigger. The cable will begin to turn. Keep one hand on cable when it is rotating. Pull approximately 5 feet of extra cable from the drum creating a slight loop of cable between the machine and the inlet, gently feeding into the inlet. Once the obstruction has been cleared, the line should be washed through with a hose or power washer. To retrieve the cable, pull one or two feet of cable from the inlet while running the machine in forward position and push the cable into the drum. 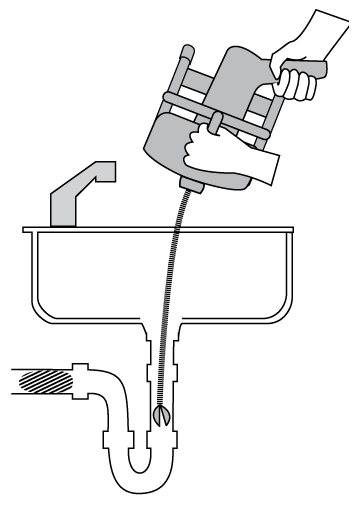 Turn off the machine; remove the remaining cable from the inlet and hand feed it back into the drum. Finally, tighten the chuck.